Freedom Debt Relief Review: Is Debt Settlement a Good Idea? Freedom Debt Relief, the largest debt settlement services provider in the country, negotiates with creditors to reduce the amount of unsecured debt you owe. It can destroy your credit. The promise of resolving debt for significantly less than you owe is not guaranteed. The debt settlement industry, including Freedom Debt Relief, has faced state and federal enforcement actions. The Consumer Financial Protection Bureau has sued Freedom Debt Relief, saying it deceived consumers. Here’s what you need to know about Freedom Debt Relief. We also provide alternatives to debt settlement you can consider. How to qualify: Freedom works with customers who struggle with high debt from credit cards, medical bills, personal loans, private student loans and other types of unsecured debt. You must have a minimum total debt balance of $7,500 to qualify. The company recommends enrolling any credit card that has a balance of $500 or more. Like other debt relief companies, Freedom cannot help clients with debt that involves collateral, such as a mortgage or car loan. It also cannot address debt from federal student loans. A typical new client has more than $25,000 in unsecured debt across eight credit accounts when they enroll with Freedom, says Sean Fox, the company’s co-president. The amount of unsecured debt ranges from $7,500 to more than $100,000, with some clients having 20 or more credit accounts, Fox says. Freedom Debt Relief is currently unavailable to borrowers in Connecticut, Georgia, Hawaii, Illinois, Kansas, Maine, Mississippi, New Hampshire, New Jersey, North Dakota, Oregon, Rhode Island, South Carolina, Vermont, Washington, West Virginia and Wyoming. The debt settlement process: The process at Freedom is typical of most debt settlement companies. Once you enroll, you stop making payments to your creditors. Instead, you open a separate savings account, which you’ll own and control, and deposit monthly payments into this account. Freedom works with clients to determine the amount to be deposited each month into the dedicated savings account. The amount is based on your ability to pay and the amount of total enrolled debt, according to the company. Stopping payments to creditors means you’ll become delinquent on the accounts, accruing late fees and interest charges, and your credit score will drop. Delinquent accounts stay on your credit reports for seven years. After the account accumulates enough money, the company begins negotiating with individual creditors on your behalf in an effort to get them to accept less than the amount you owe. The idea is that after months of nonpayment, the creditor will be motivated to take the lower sum rather than risk getting nothing at all. If a creditor accepts the lower payoff amount, you pay the creditor, either a lump sum or in installments, from your savings account. You also then pay a fee to Freedom Debt Relief for its service. Cost: By law, Freedom cannot charge upfront fees; rather, it collects a fee after each debt has been settled. The fee is based on the amount of the enrolled debt and ranges from 18% to 25%. Fees may vary depending on the state you live in, according to the company. A customer who settles a $5,000 credit card balance for $3,000, for example, would pay between $900 and $1,250 to Freedom for its service. There’s also a one-time fee of $9.95 to set up the special-purpose account, and a monthly fee of $9.95 that covers account servicing, Fox says. Time frame: The company says most customers receive their first settlement within six months after enrolling, but it can take longer depending on how much you save each month, the number of accounts enrolled in the program, and the amount owed on each account. Freedom says clients who commit to on-time monthly payments into their savings accounts resolve all of their enrolled debt within two to five years. Lawsuit: Freedom promotes its team of debt professionals who guide customers through the debt settlement process and negotiate with creditors on their behalf. In 2017, however, the company was sued by the Consumer Financial Protection Bureau, which alleged the company charged people without settling their debts as promised, made them negotiate their own settlements and misled consumers about its fees. The CFPB alleged Freedom told consumers it would negotiate all of their debts, despite knowing it could not negotiate with creditors that have a policy against such negotiations, such as Chase, American Express and Discover, according to the lawsuit. Another claim alleged that fees were charged to customers who tried to negotiate with creditors directly. Customer complaints: While Freedom has an A- rating at the Better Business Bureau, it also received more than 350 customer complaints in the past three years, including complaints about problems with its service and issues with billing and collection. A competitor, National Debt Relief, had about 80 complaints in that timeframe. It hurts your credit: Since you’re required to stop making payments on outstanding debts to enter into a debt settlement program, late payments will show up on your credit reports and your credit scores will take a significant hit, potentially affecting future applications for credit and even employment. Accounts that are delinquent stay on your credit reports for seven years, as do accounts charged off by lenders. Success isn’t guaranteed: Successfully resolving all of your debt is partially out of your control. Some creditors do not negotiate with debt settlement companies and may sell the debt to a third-party collection agency or debt buyer instead. 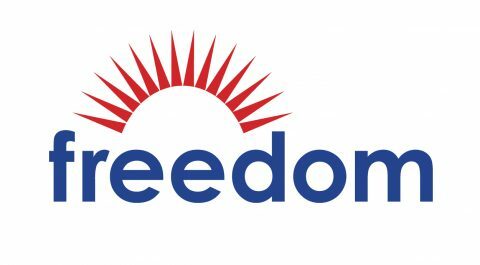 Freedom says it deals with the third party and may coach its clients to settle directly with creditors. Moreover, according to a report by the Center for Responsible Lending, consumers must continue with a debt settlement program long enough and settle at least two-thirds of the debts enrolled to benefit. Freedom’s customers require an average of three years and 10 months to complete its program. Interest and fees accumulate: Over the period in which you’re enrolled in a debt settlement program, you’ll accrue additional interest and late fees on your debt. Negotiations typically do not begin until you’ve saved enough to make a reasonable offer to creditors, which could take several months. If you fail to stay on the program long enough to complete it, or if Freedom fails to negotiate a settlement, you’ll be stuck with the higher balance. You may still hear from debt collectors: Because you stop paying your accounts, you may receive aggressive collection attempts or even lawsuits from your creditors. Freedom says it encourages clients to direct all creditor communications to the company. Forgiven debt may be taxed: Because the IRS considers forgiven debt as taxable income, it’s possible you’ll owe taxes on the amount of debt you no longer had to pay after settling. Some creditors will send a Cancellation of Debt form 1099-C. One exception is if you are insolvent (have more liabilities than assets) at the time you settle debts with your creditors. Speaking with a tax professional or lawyer for further guidance is recommended. This is a better option for someone who has a steady income to repay credit card debts within three to five years. You’ll pay a nonprofit credit counseling agency to consolidate your debts into one monthly payment at a reduced interest rate. With this option, you’ll transfer multiple debts into one new debt, via a balance transfer credit card, a debt consolidation loan, home equity loan or 401(k) loan. The new debt should carry a lower interest rate than your old debts, potentially helping you pay off your debt faster. Bankruptcy can resolve your debt under protection from a federal court, and it will erase most debts in three to six months. If you’re delinquent on debt, it will stop calls from collectors and lawsuits against you. Your credit will take a hit, as with debt settlement, but research shows credit scores tend to rebound within a year. You can pick up the phone, call your creditors and negotiate with them yourself. As with using a debt settlement company, success isn’t guaranteed, but it could save you time and money.